Hurray for October. The first full month of fall brings some of our favorite holidays: Columbus Day (the explorer’s voyage introduced Europe to chilies and, indirectly, barbacoa), for example. And Halloween. (Check out our Frankensauce and Grilled Pumpkin Pie.) This is prime tailgating season, of course. And, yes, October is National Pizza Month. You know Raichlen’s philosophy: if something tastes great baked, roasted, or fried, it probably tastes even better grilled. Case in point: pizza. 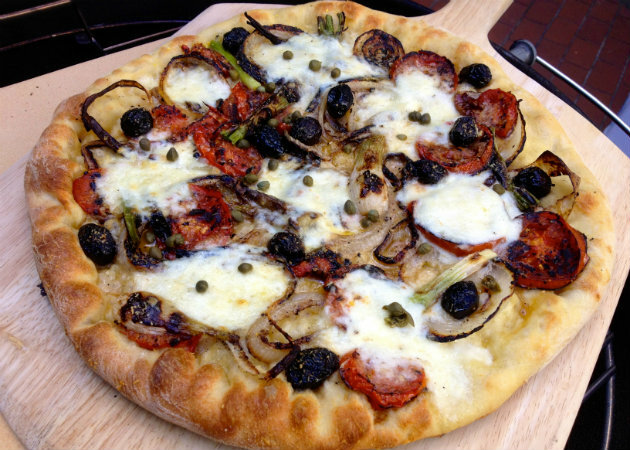 There are two ways to grill pizza: on a pizza stone (great) and directly on the grill grate (even better). To help get you started, we’ve compiled some of our favorite grilled pizza recipes and tools to enhance your experience—try them now to take full advantage of autumn grilling. This dough is exceedingly easy to make, but it may be wetter than you’re used to. That’s the best way to make a moist, puffy, crackling crisp crust on the grill. Prepare it in a food processor or in an electric stand mixer fitted with a dough hook. Don’t miss my Three-Grain Pizza Dough Recipe that combines white flour, rye flour, and stone-ground cornmeal. There’s no limit to the toppings for grilled pizza. Start with the classic arugula, tomato, mozzarella combo or pepperoni, pecorino, and tomato sauce. Venture further with crumbled Roquefort cheese, thinly sliced prosciutto, and grilled figs. Inspired by Alsacian flammekuche, this earthy bacon, onion, and potato pizza will have you salivating the moment it hits the grill. For the best results, use a smokehouse bacon like that from Nueske’s. Transform your outdoor grill into a pizza oven, using the indirect grilling method and this square cordierite pizza stone for perfectly crisp crust. Works awesome indoors, too. Transferring your homemade pizza to a hot grill grate or pizza stone can be intimidating, but not if you have a properly prepped pizza peel! (A peel is a large, flat wooden spatula that’s perfect for slipping under your entire pizza.) Be sure to dust it with cornmeal. The stainless steel blade cuts through your pizza like a pro as you use the hardwood handle to rock the cutter back and forth in quick, efficient motions. This sturdy 14-inch cast iron pizza pan gives you the powerful blast of heat needed to transform uncooked dough into killer crusty grilled pizza. It also doubles as a plancha (griddle) and super-cool serving platter for whatever you grill. Yeah, I use it a lot as a serving platter on the Project Smoke show. This nifty outdoor oven takes the guesswork out of pizza: The Pizzeria Pronto reaches cooking temperatures of over 700 degrees Fahrenheit and cooks a pizza in only 5 minutes. Perfect for tailgating or your regular family pizza night. Be sure to share your National Pizza Month pictures with us on Facebook and Twitter!